Size Chart for Magento 2 : Size Chart module allows you to display customizable pop-up tables on the product page. The size chart is necessary for apparel and footwear products. It can also be used for displaying international conversion size charts for different regions such as UK, US, or Europe. You can add images and add to cart buttons in the size chart. Size chart can be created for simple and configurable products. Size Chart for Magento 2 : Magento 2 Product Size Chart module will help you to showcase size chart on the frontend for customers to make their sizing decisions easy. 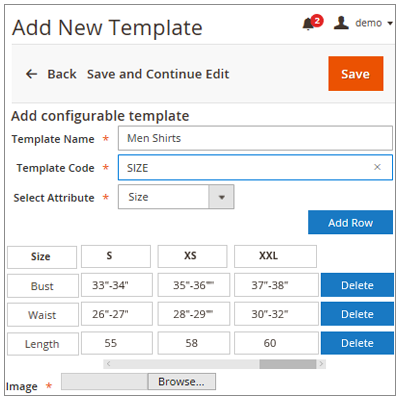 This module will allow the admin to easily create and add new size chart templates. And can use those templates while adding the products. 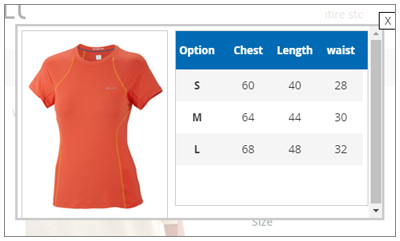 Each size chart can be assigned to product separately. The admin will be able to add two types of size charts templates – Normal and Configurable. The customers will get a button on product page and on click it will show size chart in a popup. The customers can refer the size chart to identify their accurate size. This extension is helpful for the customers as they can easily check their fit so that they can accordingly select their product size. Note: Size Chart for Magento2 works with only Simple, Virtual and Configurable products. The product options should of “Drop-Down” type, for Simple and Configurable Products. Two types of templates can be created – Normal & Configurable Product Template. Size Chart Module supports jpg, .png, .jpeg as image formats. Size Chart Module for Magento 2 works with Simple, Virtual and Configurable product types. The admin can add size chart templates to their products while adding new products. Size Chart Templates can be created for user-defined attributes in case of configurable type. Size Chart Templates can be created for custom options in case of simple type. In the case of size chart templates for simple products, there is an option to add price row. 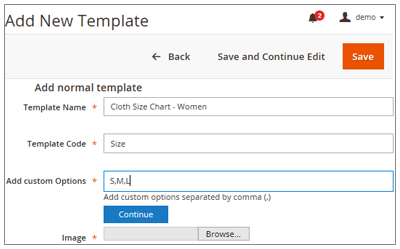 While the simple product is assigned a size chart template, Custom Options are created automatically for that product as per the template. Price row can be added or removed from the templates, it will affect the price of custom options of the product. Admin can decide, which attributes should be shown while creating new templates, in the store configuration. While being created, products can be assigned a template which will be displayed at the frontend. The admin can create new templates, delete and edit the old ones. In the case of simple products, the custom options will be displayed in the templates at the front-end. Add Custom options(these custom options become the column names). Choose the Image file for the size chart template. The admin can enter the Option title and the corresponding Option values. The admin can also add the custom price for each of the custom options. For configurable product, the admin can select the configurable product size chart template. The admin can then add the associated products but the associate products should contain the same attribute as that of selected size chart template. Select the Custom options(these custom options become the column names). Enter the custom values for the custom option like we have selected the color attribute and add the option values for the two color variations. The customers will get a button “view size chart” on the product page. Click on it to view the size chart in a popup. The customers can refer the size chart to identify their accurate size. This extension is helpful for the customers as they can easily check their fit so that they can accordingly select their product size. + Updated for Magento version 2.2.*. + For simple products, custom options will be created automatically as per the size chart template. Did you buy Size Chart for Magento 2? Great quality of coding and most of all great support when we requested to have some changes that where not default plugin's features.